Nikon recently announced the Nikon D5100, a Nikon DX-format digital-SLR camera equipped with a vari-angle monitor, and a 16.2 megapixels CMOS image sensor and the EXPEED 2 image-processing engine that enable high-resolution rendering. It is also equipped with the D-Movie function that supports recording of full-HD (1920 X 1080p, 30p) movies. Along with this, are the in-camera movie editing functions that allow users to delete unnecessary portions from the beginning and/or end of movie files. There is also an HDMI output so that the users can show off their full-HD videos to their family and friends. What I am excited about the Nikon D5100 is the Special Effects mode. This is the first Nikon DSLR to offer this feature and the user can choose from seven special effects, including selective color where the entire photo is in black and white except for the elements chosen by the user. There is also the night vision which allows the user to capture images even in extremely dark places. The special effects can be viewed through the lens before shooting, allowing users to see and confirm the results. Complementing these features is the new High Dynamic Range (HDR) function which captures two shots at different exposures and combine these to create a single image that has little or no loss of highlights. Another neat feature of this camera is the vari-angle monitor. The vari-angle monitor opens from 0 to 180° to the side, and can be rotated up to 90° clockwise and up to 180° counter-clockwise when it is open. This will come in handy when shooting in a crowded place and the standard monitor won't do the job. The 3-inch monitor is also bigger than the one in Nikon D5000 and since the hinge is now on the side, it will not hit the tripod when the camera is mounted. 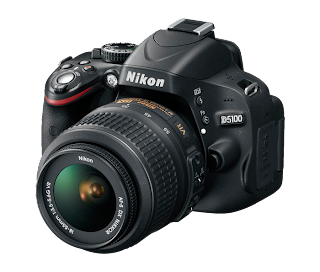 The Nikon D5100 allows continuous shooting at up to approximately 4fps. 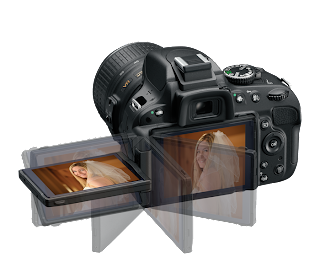 It also has a quiet shutter release mode for shooting in places and situations that needs quieter shutter operations. The Nikon D5100 comes with an AF-S DX NIKKOR 18-55mm f/3.5-5.6G VR kit lens. Amazon.com offers it at $899. I'm seriously thinking about it. Either this or the Nikon D90.